Windows 10 was officially launched in 2015 and is apparently intended to be the last Microsoft product to carry the name "Windows". Designed to tie together multiple devices such as PCs, Tablets, Laptops and Smart Phones under one Microsoft Operating system, Windows 10 was intended to provide a solid platform from which Microsoft could "rule" these markets. For this reason, Windows 10 was offered as a free upgrade to owners of legitimate (legal) Windows 7, Windows 8 and Windows 8.1 systems. At the time of writing (Oct 2015), having seen multiple versions on many devices, our conclusion; much better than Windows 8 and Windows 8.1; slightly better than Windows 7. The fact is that although Windows 10 is very good, Windows 10 was never going to be perfect. In some cases, the Windows 10 upgrade will fail due to a computer virus infection. 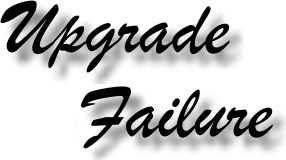 If a Windows 10 upgrade fails during the upgrade process, this will usually corrupt Windows and can render the computer unusable. 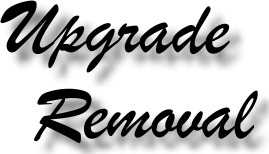 The solution is to remove the hard disk drive, copy the personal files (pictures, documents etc) to a different computer and then perform a full reinstallation of the original Operating system (Windows 7, 8 or 8.1). Download and install all updates (there may be over 200 Windows updates), copy the documents back to the correct folders and then (if desired) re run the Windows 10 installation from a USB flash drive. Computer drivers are small programs which tell a computer how to control devices which are built into, or attached to a computer. If items fail to work following a Windows 10 upgrade, thus will usually be due to driver failure. On several Asus and Acer systems, the keyboard fails to work correctly after performing a Windows 10 upgrade. In many cases this is due to incompatible touchpad drivers. Upgrading the touchpad drivers therefore resolves the issue. In many cases there are issues with Graphics card drivers. The most common of these seem to relate to NVidia graphics cards. Eg; in some cases, systems which are connected to large TVs etc via HDMI leads fail following a Windows 10 upgrade. This is due to the correct drivers not being installed. Windows 10 therefore uses either basic or generic drivers, but these will not allow the graphics card to provide video and / or sound via HDMI. The solution is again to upgrade the driver. However; in many cases the correct driver is not available and the only solutions are to connect to a different device, install a new graphics card with compatible drivers or return to Windows 7, Windows 8 or Windows 8.1. Regarding Toshiba laptops which have been upgraded to Windows 10. There are numerous issues but the worst encountered so for relates to the Toshiba Satellite C850 (Windows 8 system). On some machines, after upgrading; the Battery fails to charge, the function keys do not work and the DVD drive does not work (when interrogated it reports a code 19 error). 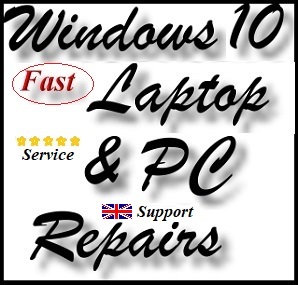 The battery and function key issues can be resolved by performing all updates and then installing the Windows drivers individually from within device manager and install the Toshiba Windows 8.1 upgrade drivers and rebooting the system. To resolve the DVD drive issue; uninstall the Toshiba Recovery Disk creation software and reboot the system. 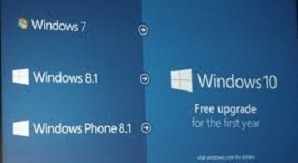 If you wish to return to Windows 7, Windows 8 or Windows 8.1 following a Windows 10 installation, there are 3 options. Option 1; Please click on the Windows 10 flag symbol ( ) with the right hand mouse button. Select "Control Panel". Go to the "View By" window and select "Small Icons". 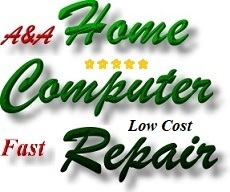 Click on "Backup and Restore (Windows 7)". Follow the onscreen instructions. Option 2; Use your Windows recovery disks to fully reinstall Windows 7, Windows 8 or Windows 8.1. Option 3; Simply call us on Telford (01952) 793050. We will typically be able to advise on the problem over the phone. 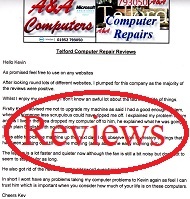 Most Computer Repairs, Upgrades, Upgrade Removals, Virus Removals and Reinstallations and are completed within 24 to 48 hours.